The imposing church of St Mary in the Dorset village of Beaminster contains two important monuments. The larger of the two monuments on the south wall commemorates George Strode who died in 1753 and was sculpted by Peter Scheemakers. The other monument is that to Thomas Strode, Sergeant at Law who died in 1698. Thomas was born in 1628, the son of Sir John Strode and his second wife Anne, the daughter of Sir John Wyndham of Orchard. The Strode family lived at Parnham, a mid sixteenth century house about ¾ of a mile south south east from the village. The first Parnham House was built around 1400 by the Gerard family. It passed into the hands of the Strode family in the reign of Henry VI when Richard Strode married Elizabeth Gerard and it remained in the family for three hundred years. Under the Strodes the estate flourished, not least because of their knack of marrying rich wives. In 1522 Sir Robert Stroud married the daughter of Sir John Hody, Henry VIII’s Lord Chief Baron of the Exchequer and her considerable fortune helped him to rebuild Parnham. Thomas Strode studied at Oxford matriculating on 1 July 1642. He was called to the bar at the Inner Temple in 1657 and made Sergeant at Law in 1677. On 1st February 1664/5 he married Mary Adams, the widow of Parkinson Odber, also a lawyer who, like Strode, went up to Oxford. He matriculated on 15 July 1639 aged 14! He died c1660. Ex quâ filiam suscepit unicam adhue superstitem. Thomas Strode, Sergeant at Law, who quietly fell asleep in Christ on February 4 1698, at the age of 70, here deposited the remains of mortality. He was a man consecrated to undying memory: distinguished by knowledge of the law, piety and wisdom: uniting in his character both integrity and great sweetness; ever faithful to God, Prince and friends. Born of a father, Sir John Strode of Parnham in the County of Dorset he took to his most dear wife Mary Adams, the widow of Parkinson Odber, Gent, who bore him one daughter as yet living, who most sorrowful and groaning with tears as a last act of piety this [well-deserved] monument willingly ordered and placed. The question that needs to be addressed is who made this imposing monument? It is clearly a very high quality piece and probably a metropolitan product. Thomas Strode and his brother Sir George Strode, also a Sergeant at Law, were the executors of Sir Hugh Wyndam, died 1684 and whose large monument, erected in 1692 can be seen at Silton, also in Dorset. The Wyndham monument is unsigned but is the work of John Nost (died August 1710) while that at Sherbourne Abbey to John Digby, Earl of Bristol who died in 1698 is signed by Nost and is the only monument to bear his signature. It can be assumed that as executors of Sir Hugh’s estate they may well have been involved in the contract for the monument and therefore knew of Nost. Beaminster is approximately half way between Silton and Sherbourne and there is more than a passing similarity between the Strode monument and the other two. In the Silton monument the left foot of Sir Hugh is projecting forward and at an angle and the right hand holds a scroll so as to give balance to the figure. Precisely this arrangement is repeated on the figure to Thomas Strode while at Sherbourne the Earl holds a coronet in his right hand and the left foot is slightly forward but balanced by the left hand resting on the hip. The treatment of the wig is identical on the Beaminster and Sherbourne figures. 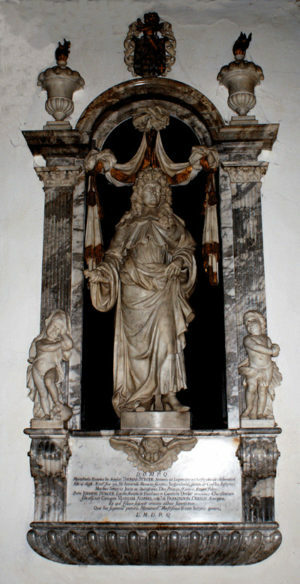 The drapery above the heads is very similar in all three examples and the monuments are all made of fine white marble. Architecturally, the Wyndham and Digby monuments are clearly similar, the former having barley twist columns to support the superstructure but the coffered soffit, square capitals and, lower down, Corinthian capitals are the same in both examples. However, this is not so surprising when we realise that Rachel, second daughter of Sir Hugh Wyndham by his first wife Jane Wodehouse, was the second wife of John Digby and became Countess of Bristol in August 1663. The inference is that it was Rachel who was responsible for commissioning Nost to produce the monument to her husband, having seen at first hand the quality of his work in the monument to her father. The Strode monument uses pilasters to support the canopy. The floral decoration seen on the Digby and Wyndham monuments is absent on the Strode piece and the weeping putti are, like those seen on the Digby piece, much more conventional in their treatment unlike the Wyndham examples where the weepers are almost life sized. All three monuments make use of black backgrounds. The Digby example is flat while Wyndham and Strode stand within black marble niches, the former on a raised gadrooned plinth upon which the weepers are seated. Nost has only five works attributed to him in the Biographical Dictionary of British Sculptors (Roscoe, Hardy and Sullivan 2009) but his principal business activity was in the production of lead garden statues. 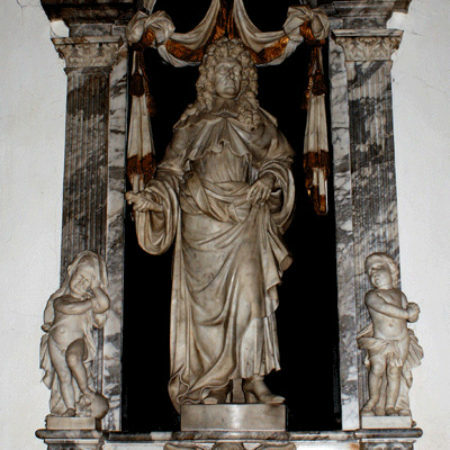 The Spencer monument at Yarnton in Oxfordshire (1684) is also firmly attributed to Nost as is that at Wanstead, Essex to Sir Joshua Child (1699) and it appears that one of his trademarks is the pose he uses for his principal figures marked by a projecting left foot. There is increasing evidence to suggest that Nost produced more monuments than currently ascribed to him and from the evidence it can be said that the Strode monument at Beaminster is one of them. I am grateful to Dr Jean Wilson for translating the inscription.